Another chapter of a story that began in 1996, when we set apart the 20 best barrels provided by that year's harvest, and bottled them on their own. From then until now, this range continues to convey our profound commitment to terroir expression and enological excellence. A sophisticated and complex Pinot Noir that brings together New World fruit and the centennial Burgundian winemaking tradition. Notes of fresh cherry, strawberry and plum mingle with leather and tobacco in the background. Smooth, complex and enveloping. Hand picked between March 19th to April 7th, 2011. Destemmed before maceration and fermented for 6 days in stainless steel tanks at 27 °C. The wine is then aged in French oak for 12 months at 12 °C and a further 1 month in stainless steel tanks at 12 °C. 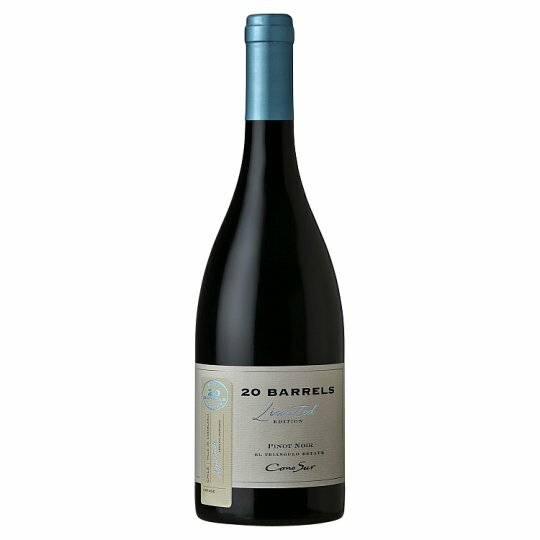 20 Barrels Limited Edition is Cono Sur's top range of wines, the first vintage was released in 1996, when the winemaking team decided to put aside 20 of the very best barrels of Casablanca Pinot Noir from that year, hence the name. The range has gradually expanded to include other classic grape varieties, when winemaker, Adolfo Hurtado, feels he has found the ideal vineyard to produce the best example fruit possible for each variety. And its gifted wine valleys between the Andes Mountains and the Pacific Ocean. Cono Sur produces wines that are premium and expressive, conveying the spirit of the New World. To the west of Santiago and practically touching Chile's central coast, Casablanca Valley's Mediterranean-cold weather is strongly influenced by the Pacific Ocean and its cold Humboldt current, a chilling agent born at the very Antarctica and whose effects can be felt all along the Chilean coast. Humboldt makes itself present through the fog, cloudiness and cooling breezes that characterize the region and conspire to produce a relatively delayed harvest. Especially suited for whites and Pinot Noir.